Republicans on Capitol Hill who are fighting to prevent the Democrats' proposals for health-care reform, particularly the so-called "public option," from becoming law are finding themselves on the outs with public opinion --again. At least three new polls show that the public strongly disapproves of the GOP's performance in the health-care debate. A new Washington Post/ABC News poll shows that support for a government-run health-care plan to compete with private insurers has bounced back from losses incurred over the summer and now stands at a solid 57 percent majority. Forty percent are opposed. Meanwhile, a Wall Street Journal/NBC News poll shows a nearly two-thirds majority disapproves of how congressional Republicans are handling the issue of health care overhaul, while just 21 percent said they approve. The poll also found that nearly four times as many Americans would blame the GOP than would blame the Democrats if Congress fails to pass health-care reform. More alarming for Republicans in the long run, the Washington Post/ABC News poll found that fewer Americans now identify themselves as Republicans than at any time since 1983, with Republicans now comprising only 20 percent of the electorate. The findings represent a seven-point drop in voter identification with the GOP since a similar poll released 20 months ago by the Pew Center for the People and the Press. The Post/ABC poll found that a staggering 79 percent of Americans expressed a lack of confidence in the GOP's ability to make the right decisions for the future of the nation, while just 19 percent expressed full confidence in the the Republicans. Among independent voters -- without whom neither party can win the White House or a congressional majority -- Republicans fare even worse, with more than four out of every five independents voicing no confidence in the GOP. Support for a "public option" is running particularly strong among two voting blocs the GOP has been targeting for weeks in their drive to defeat it: Independents and seniors, with the poll showing the option drawing particularly strong support if it is administered by the states, rather than by the federal government, and if it is targeted specifically to Americans who can't afford private health insurance. Under those two circumstances, support for a "public option" soars to 76 percent -- with even 56 percent of Republicans in favor. Despite what appears to be solid support for the "public option" and for a proposal to make health insurance mandatory for all Americans, the public remains sharply divided about the five health-care reform bills now pending in Congress, according to the Post/ABC poll, reflecting a sharply partisan split over what President Obama has called his top legislative priority. The Post/ABC News poll found that the bills have 45 percent support, while 48 percent oppose them, roughly unchanged from a previous poll released in August. The partisan divide over the bills is both predictable and stark: Over 70 percent of Democrats support the plans, while nearly 90 percent of Republicans oppose it. Independents have more mixed feelings about the plan, with 42 percent in favor and 52 percent opposed. However, the proportion of Democrats in favor of the plan is down from 46 percent recorded in September, perhaps reflecting a growing impatience among liberals with President Obama over the "public option." Liberal Democrats -- particularly in the House -- have made it clear that they won't accept any final health-care reform bill that does not contain a "public option" -- which is fiercely opposed by Republicans and conservative Senate Democrats. The new poll numbers are likely to harden the liberals' resolve. That impatience among liberals is also being reflected in Obama's job-approval ratings among his fellow Democrats on the health-care reform issue. The Post/ABC News poll found that the president's rating fell among his fellow Democrats by 15 points from a high of 85 percent last month. GOP'S RATINGS ON HEALTH CARE REMAIN DISMAL . . .
Evan as the president and Capitol Hill Democrats continue to struggle on a final health-care reform bill, their Republican rivals are faring very poorly on the issue, with a solid 65 percent majority in the Wall Street Journal/NBC News poll disapproving of the GOP's handling of the health-care issue. Only 21 percent approve. The new numbers show a three-percentage-point worsening of the public's disapproval of the Republicans' handling of the health-care reform issue since September, when 62 percent disapproved. The percentage who approved remained unchanged. More ominous for the GOP, the Journal/NBC News poll found that if Congress fails to pass health-care reform, nearly four times as many Americans would hold congressional Republicans responsible for the reform plan's failure (37 percent) than they would the president (10 percent) or congressional Democrats (16 percent). Twenty-three percent would blame both parties. The GOP's poor marks on health care come against the backdrop of even more dismal public confidence in the Republicans' overall ability to make the right decisions for the future of the country. Less than a fifth of Americans in the Post/ABC News poll have confidence in the GOP to lead the country, while a overwhelming 79 percent expressed no confidence. Less than one in five voters (19 percent) expressed confidence in Republicans' ability to make the right decisions for America's future while a whopping 79 percent lacked that confidence. Among the all-important independent voters -- who now outnumber both Republicans and Democrats and who voted strongly for the Democrats in the last two election cycles -- confidence in the GOP stands at a record-low 17 percent, while a record-high 83 percent of independents voiced no confidence in the Republicans. By comparison, the president's own confidence ratings aren't all that impressive either -- Only 49 percent expressed confidence in Obama, while 50 percent voiced a lack of confidence in him. But as weak as public confidence in the president is, it's still far greater than that of the GOP. As bad at the GOP's standing is now, the party's long-term future is looking increasingly bleak, as the percentage of the electorate that identifies with the Republicans continues to erode. Only 20 percent of Americans in the Post/ABC News poll now identify themselves as Republicans -- the lowest GOP party affiliation in a quarter-century. The new findings continue a trend that was noted more than a year and a half ago by the Pew Center, whose poll in March 2008 found that identification with the GOP had fallen to 27 percent of the electorate, while Democrats and independents increased to a 36 percent tie. A look at voters' ideological leanings is telling. Significantly, the bulk of the GOP's losses is among moderates and traditional conservatives who have become increasingly alarmed by what they see as a dangerous turn by the party to the far-right fringe and have moved into the independents' column. Independents now comprise a 42 percent plurality of the electorate, with Democrats making up 33 percent. There are now enough independents to create a third major political party if they so chose. And a new party is not beyond the realm of possibility. Texas billionaire H. Ross Perot may have been 20 years ahead of his time when he founded his short-lived Reform Party -- with its appeal to voters disenchanted by the liberal leanings of the Democrats and the conservative tilt of the Republicans -- in 1997. It's happened before at least once in the nation's history: The Republicans, founded in 1854 as an anti-slavery party, itself eventually replaced a moribund political party -- the Whigs -- in the 1870s after the Civil War. As a growing number of children, teenagers and college-age young adults have come down with the H1N1 swine flu -- and the number of new cases is likely to rise dramatically this winter -- fewer than half of Americans say that they're planning to receive the new H1N1 swine flu vaccine, according to recent polls. It's a trend that is leaving many health professionals worried that the death toll from H1N1 will also rise dramatically. Even as supplies of the regular seasonal flu vaccine has fallen behind the demand, the public's skepticism over the H1N1 vaccine has persisted, despite warnings that the number of H1N1 cases already has reached pandemic proportions. HONOLULU -- In response to concerns about the safety of the H1N1 swine flu vaccine now being produced and distributed, the Centers for Disease Control said Monday that the vaccine is completely different from that used in the government's ill-fated swine flu immunization program in the 1970s. In an interview with KHNL-TV in Honolulu, Dr. William Gallo, a CDC senior management executive, said that the new vaccine is a different formula from that used in 1976 and more closely resembles the seasonal flu vaccine that is used every flu season. "It's immunized hundreds of millions of people," Gallo said, adding that the new H1N1 vaccine was subjected to the same safety checks that the seasonal flu vaccine undergoes each year. Concerns were raised by memories of the ill-fated 1976 swine flu vaccine, which, it was discovered, increased the risk of developing Guillain-Barre syndrome, a rare neuromuscular disorder which causes paralysis. More than 500 people who were administered the original swine flu vaccine in 1976 developed the disorder. Unlike the seasonal flu, which strikes indiscriminately and is especially hazardous to the elderly, the H1N1 swine flu is striking mostly young adults, teenagers and pre-teen children. The federal Centers for Disease Control and Prevention in Atlanta says a total of 86 children under 18 years of age have died from the 2009 H1N1 virus since it first surfaced last March, the CDC's Dr. Anne Schuchat told reporters in a briefing on Friday. Eleven of those deaths were reported just in the past week, Schichat said. Distribution of the vaccine against the H1N1 virus is now under way, with priority being given to to those considered at high risk, including health care workers, pregnant women and children. But the CDC says some deliveries of vaccine will be delayed because production is lower than expected. This has caused shortages of both the seasonal flu and H1N1 vaccines, forcing many hospitals, employers, schools and colleges to postpone or cancel scheduled flu-shot workshops. But officials clearly do not want to trigger a panic. Despite the growing threat that H1N1 poses, however, a growing number of Americans are shying away from taking the H1N1 vaccine. Even many health care workers are reluctant to be immunized, with a recent survey by the National Foundation for Infectious Diseases finding that only 42 percent of health care workers are getting themselves immunized. The reason: Persistent concerns about whether the H1N1 vaccine is safe. It's a concern that dates back more than 30 years -- ever since a U.S. government-sponsored swine flu vaccination program in 1976 collapsed in disarray amid production delays, public-relations problems and a wave of fear generated by a frenzy of media coverage of three elderly people who died within hours after taking the vaccine. To make matters worse, it was soon discovered that people who were administered the H1N1 vaccine back then had an increased risk of developing a rare neuromuscular disease. More than 500 people did develop the disease, 25 of whom died from it. That discovery forced the federal government, under then-President Gerald Ford, to call a halt to the program, which cost taxpayers over $400 million, and to pay out millions more in compensation to the families of those who died after taking the vaccine. "I'm genuinely baffled," Arthur Kellermann, an emergency medicine physician at the Emory University School of Medicine, told National Public Radio. "The public has developed this odd sense of complacency. The only thing that comes to my mind is photos of people standing on the seawall of Galveston hours before [Hurricane Ike] hit." For public health officials and the medical community, convincing more people to take the H1N1 vaccine is going to be a tough sell. Part of the problem is the lack of availability -- for now -- of both the H1N1 and regular seasonal flu vaccines caused by production delays. But the greatest obstacle may be the lingering memory of the 1976 swine flu vaccination debacle. A recent survey by the Harvard University School of Public Health found that nearly a third of Americans expressed concerns about the safety of the new H1N1 vaccine. "If [the] vaccines work, then those who have been vaccinated have nothing to fear," said Barbara Loe Fisher, co-founder of the National Vaccine Information Center, in an interview with the America Online News Service. But Fisher is not convinced that the H1N1 virus is as serious a threat as federal health officials claim it is. "Does this particular strain of influenza warrant the amount of money we're spending and this campaign the government is waging?" she asked rhetorically. "Federal health officials are making a mistake. There's been an overreach. People don't appreciate being bullied. A lot of people are starting to stay away from doctors. There's a paradigm shift occurring." That Fisher is skeptical of the federal government's handling of the H1N1 threat can't be dismissed as mere partisan sniping, although to be sure, there are some -- most notably right-wing radio talk-show host Rush Limbaugh -- who have used the H1N1 threat to score political points against the Obama administration. But the 1976 swine flu fiasco hasn't faded from the public consciousness even after 33 years --and isn't likely to fade any time soon. During the first two months of 1976, about 500 recruits at the U.S. Army base at Fort Dix, New Jersey fell ill with flu-like symptoms, despite having been vaccinated against several flu viruses that were circulating at the time. On February 5, one recruit died within 24 hours after he fell ill and four of his fellow soldiers were later hospitalized. Two weeks after the soldier's death, health officials announced that the cause of death was a new strain of the swine influenza A virus -- H1N1. The virus was detected only from January 19 to February 9 and never spread beyond Fort Dix. At the same time, however, a second swine flu strain, H3N2, was discovered and appeared to be related to the virus involved in the 1918 "Spanish Flu" pandemic -- the most lethal in the planet's history -- that felled over a billion people worldwide, killing over 22 million. Although neither virus spread beyond Fort Dix, public-health officials were nonetheless alarmed by what they saw as an imminent threat of another global flu pandemic. 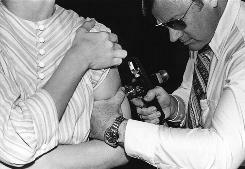 Led by then-CDC Director Dr. David Sencer, they strongly urged Ford to launch a program to have every person in the U.S. vaccinated for the disease. Ford agreed. But the program was doomed from the start. For one thing, the fear that the world in 1976 was about to experience a repeat of the 1918 pandemic was based on the erroneous assumption that it was caused by H1N1, when in fact, the 1918 pandemic -- which killed a half-million Americans -- was actually caused by the avian flu virus, H5N1. Moreover, as noted by The Washington Post, of the 500 soldiers at Fort Dix who had been infected with swine flu, only one of them died -- which raised questions about just how lethal the disease really was. And not only did the swine flu viruses not spread beyond Fort Dix, there were no cases of swine flu reported throughout the summer of 1976 in the Southern Hemisphere -- where it was winter and where flu outbreaks would have been expected. On October 1, 1976, the immunizations against swine flu began. Within ten days, approximately 40 million people had received the vaccine, mostly through newly-designed compressed-air vaccination guns instead of traditional needle injections. All seemed to go well, until the news broke on October 11 that three senior citizens in Pittsburgh who received the vaccine that day died just a few hours later. That set off a media frenzy, with news outlets speculating, without a shred of evidence, that the deaths were caused by the vaccine. As it turned out, the three deaths were from other causes that had nothing to do with the H1N1 vaccine. But the damage was done. The public came to believe that the vaccine caused the three elderly people's deaths. And that belief persists to this day. That was bad enough. What really killed the vaccination program was the discovery in November 1976 that the H1N1 vaccine increased the risk of developing a paralyzing neuromuscular disease called Guillain-Barré syndrome. More than 500 people who were administered the vaccine developed Guillain-Barré syndrome, of which 25 died. The federal government was forced to halt the program and paid millions of dollars in compensation to the families of those who died. The fiasco ultimately cost Sencer his job as head of the CDC. WHAT ABOUT TODAY'S H1N1 FLU THREAT? Looking back on the 1976 swine flu immunization program, it's easy to brand it a debacle. And it could happen again. Last week, a 14-year-old British girl died suddenly, just hours after she received a vaccination for cervical cancer. Newspapers quickly picked up the story, running headlines implying the vaccine killed her. But an autopsy revealed two days later that the real cause of the girl's death wasn't the cancer vaccine, but rather a previously undiagnosed tumor located in her chest. The hardest job for the CDC and other health authorities is likely to be convincing the public that the new H1N1 vaccine is safe. CDC spokeswoman Arleen Porcell-Pharr has spent weeks seeking to do just that, emphasizing that the vaccine has been tested and approved by the Food and Drug Administration. "We expect the 2009 H1N1 influenza vaccine to have a similar safety profile as seasonal flu vaccines, which have very good safety track records," she said. But skeptics like Eileen Karpfinger, a licensed chiropractor and co-founder of the Upaya Center for Wellbeing in Alameda, California, remain unconvinced. "It's ludicrous to me that I have to put my child through this," Karpfinger told AOL News, referring to vaccines in general. "As a mother I don't find vaccines to be effective."